Throughout the Summer, the (JPII) Adult Program is going on a figurative journey “Around the World in Eighty Days.” Using the book (of the same title) as a field guide, individuals will be learning about maps, transportation, and various locations throughout the world. Projects and activities include things like making passports, learning about Police officers (because of Detective Fix from the story), learning how to navigate with a compass, and writing out names in hieroglyphics (as seen above). They will also get a look at the author (Jules Verne), some of the characters from the book, and their various occupations. For instance, Phileas Fogg is a very precise man in the story, so individuals will take a closer look at numbers and how they correlate with traveling. Another example includes Jean Passepartout, who held previous occupations such as acrobat and fireman. 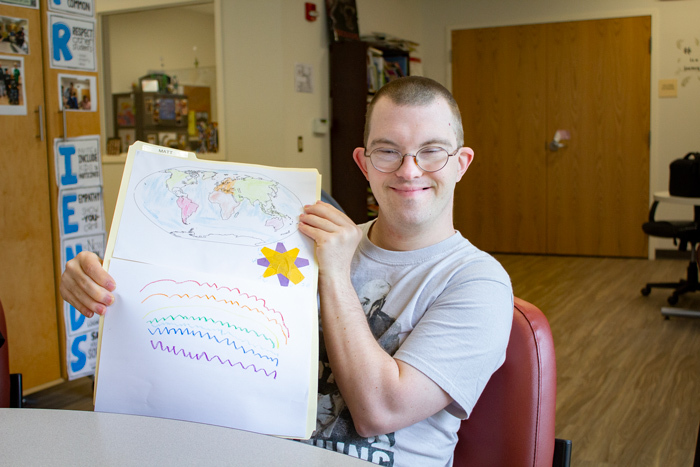 The inclusion of details in the story give the Adult Program the chance to learn about something they may not have thought of before. The entire journey will actually last about eighty days, carrying our sessions through the summer. Be sure to stay up to date by keeping and eye on our Instagram and Facebook pages!